12:02 PM - Sg612 quoted plantwitch in post New gecko- transitioning to a schedule + handling tips? 11:45 AM - plantwitch quoted Sg612 in post New gecko- transitioning to a schedule + handling tips? 11:25 AM - Sg612 quoted plantwitch in post New gecko- transitioning to a schedule + handling tips? 11:20 AM - plantwitch quoted Sg612 in post New gecko- transitioning to a schedule + handling tips? 11:06 AM - Sg612 quoted plantwitch in post New gecko- transitioning to a schedule + handling tips? 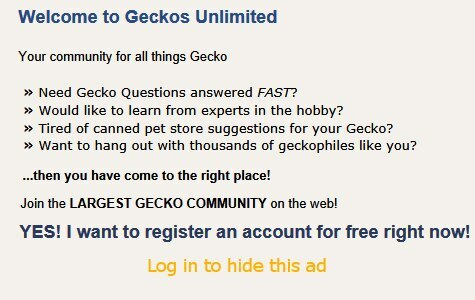 10:51 AM - plantwitch quoted Sg612 in post New gecko- transitioning to a schedule + handling tips? 09:48 AM - Sg612 quoted plantwitch in post New gecko- transitioning to a schedule + handling tips? 09:38 AM - plantwitch quoted Sg612 in post New gecko- transitioning to a schedule + handling tips? 07:21 AM - plantwitch quoted Elizabeth Freer in post New gecko- transitioning to a schedule + handling tips? 06:17 PM - Elizabeth Freer quoted plantwitch in post New gecko- transitioning to a schedule + handling tips? 12:41 AM - plantwitch quoted Elizabeth Freer in post New gecko- transitioning to a schedule + handling tips? 04:00 PM - Elizabeth Freer quoted plantwitch in post New gecko- transitioning to a schedule + handling tips? 09:20 AM - plantwitch quoted Elizabeth Freer in post New gecko- transitioning to a schedule + handling tips? 03:54 PM - Elizabeth Freer quoted plantwitch in post New gecko- transitioning to a schedule + handling tips? 06:33 AM - plantwitch quoted Elizabeth Freer in post New gecko- transitioning to a schedule + handling tips? 01:42 AM - Elizabeth Freer quoted plantwitch in post New gecko- transitioning to a schedule + handling tips? 02:35 AM - Elizabeth Freer quoted plantwitch in post New gecko- transitioning to a schedule + handling tips? 08:58 PM - plantwitch quoted Elizabeth Freer in post New gecko- transitioning to a schedule + handling tips?